Newton's Nook Designs: Spring Coffee Lovers Blog Hop! This is our second post today - to see our March Release Blog Hop Winners, scroll down or click here. 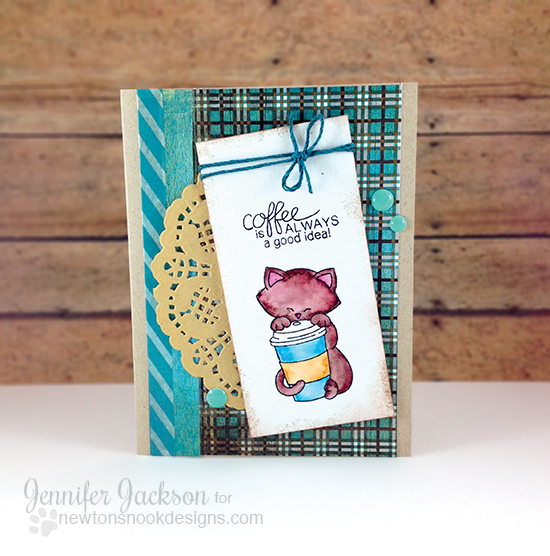 Today I'm playing along with the very fun Coffee Lovers blog hop. I used our Newton Loves Coffee stamp et since it features our favorite feline and, of course, coffee. I stamped the image of the kitty hugging the "to go" coffee mug onto watercolor paper. I colored the image using Distress markers and added a bit of distress ink on the paper edges. I used the "Coffee is ALWAYS a good idea" sentiment, also from the Newton Loves Coffee stamp set above the image. Then I layered it with a kraft colored doily, some plaid paper and striped washi tape. I added on a bit of blue twine and teal epoxy dots too. I love how this turned out! True story - our real kitty, Newton, DOES LOVE COFFEE! I can't leave it unguarded or he will come stick his paw into the mug and then lick it! Silly kitty! Very cute. Great coloring and I like the plaid background and doily. Fabulous colors and card, Jennifer, I always enjoy your images! Thanks for being a Super Sponsor! Happy Friday! I ALWAYS love that kitty w/ coffee image. Adorable!! And such a perfect card for him! Thanks for being a Super Sponsor and thanks for the super cute card!! Newton is so adorable, I love my stamp set; but will be back to look at your newer products. Thanks for being a Super Sponsor for the Spring Coffee Lovers BlogHop. loooove this super cute kitty card! Very cute!!! Thank you for sponsoring the Spring coffee blog hop!! This is SO cute, I need to break open my Newton coffee set and make a card for the hop! Just adorable, loving the plaid paper and kraft doily you used too. Thanks for being a Super Sponsor. How cute!!! Thanks for being a Super Sponsor for the Spring Coffee Lovers Blog Hop. Wow! Amazing!!!! I love the colours and this sweet cat!!! Ooohh my goodness what a lovely card. Like the whole look of it and in my favorite colours toooo. That is one adorable and cute card! Newton's always a cutie pie! Love the paper color combo!! Thanks for sponsoring the hop! Total cuteness!! Thanks so much for sponsoring. It's appreciated so much! AWW what a cute kitty card. And I love that your cat loves coffee! How fun! Love that Newton coffee stamp. Card is adorable. Thanks! Gotta love Newton! Thanks for being a sponsor. Your Newton has excellent taste...and manners, too *grin*! Fabulous card...makes me smile! AND thank you for being a super sponsor! So sweet...just love your adorable card. Fun card! Fun coloring and fun colors!! thanks for the inspiration! So cute. Thanks for being a super sponsor. Adorable! thanks for being a super sponsor! Oh, super fun coffee card!! I received got this set and can't wait to submit a card on the hop with it! Thanks so much for being a Super Sponsor and making this hop even MORE fun!! Awwwww...I love this! So adorable. I can just imagine your kitty trying to dip it's paw in your coffee :o). Thanks for being a super sponsor! Super cute kitty with the cup, fabulous card. I love this set!! I don't get to use it enough... hopefully this week! I got a cute Halloween one that will be used for the next one! And I LOVE seeing the pictures of Newton on IG... thanks so much for being a sponsor! Cute card, neat colors and great coloring. This is just precious. I love the colours. Thank you for being a sponsor. The colors on the card are very lovely. What a cute little kitty. No coffee for him though. It would be like catnip x 10. I really enjoy those little epoxy dots, too. What a sweet card! Thanks for a fun hop stop! 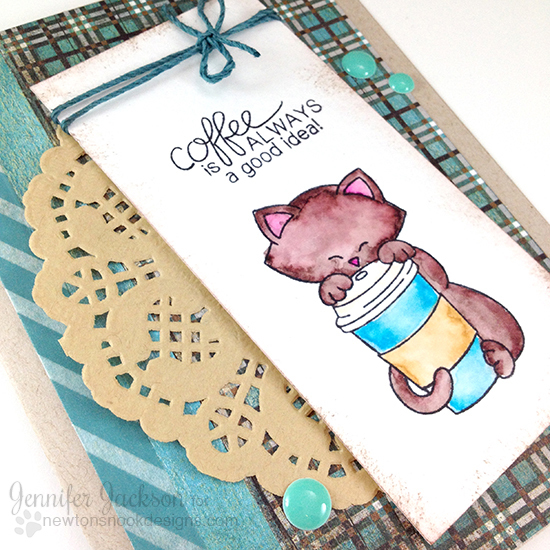 What an adorable card and yes, coffee is always a good idea! Thank you for sponsoring again! Always a pleasure to see Newton with some java Joe! Very cute card! Thanks so much for sponsoring this very fun coffee-lovin' blog hop! Sweet Kitty and coffee! Yum! Thank you for sponsoring the challenge - I look forward to creating! Cute, cute, cute! I LOVE that image. (So much..that I used it on my card.) ;-) Thanks for sharing and sponsoring. How could anyone resist a coffee-lovin' CUTIE like Newton? LOVE your PRETTY colours and layers Jen!!! OMGoodness I can just see Newton doing that now. lol. Thanks for sharing the cute card. What a lovely card! I love it! Love your Newton with his cup. Never heard of a cat that likes coffee, he's got to be a fun kitty. Thanks for sponsoring the fun at the Coffee Hop! Your kitty is so adorable! Love your card! Thanks for being a super sponsor! Super cute card!! Funny that a cat likes coffee!! Very sweet card...love the cute image and kraft doily. Adorable image and fun design, Jennifer. 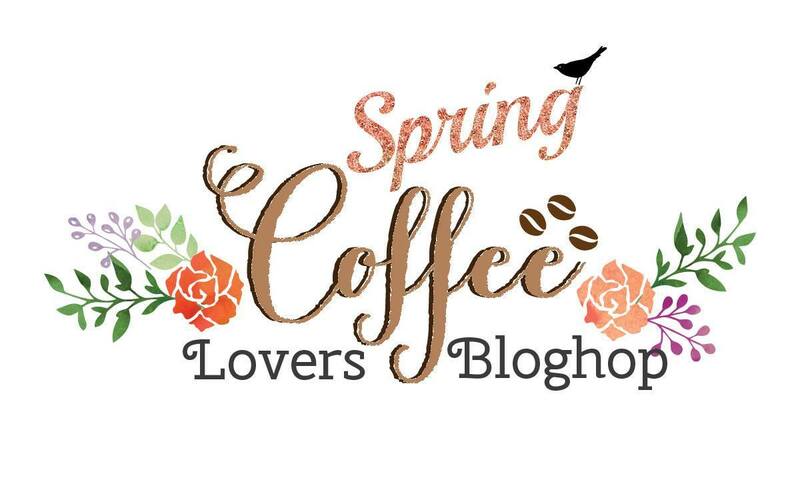 Thanks for sponsoring the Spring Coffee Lovers Blog Hop! I love this kitty with a mug! Super cute! Thanks for being a super sponsor too! Such a cute kitty and love the card. Thanks for being a sponsor. can't believe your cat likes coffee. I cannot imagine a cat with caffeine, lol... adorable card. thanks for sponsoring the hop! Adorable card and terrific color palate. Thanks for being a fabulous sponsor! Love Newton with that big coffee cup! Awwww, how cute is Newton with HIS coffee? Super sweet! That plaid paper is just the sweetest! Love how you colored Newton's fur! Thank you so much for being an awesome sponsor and helping to make the hop even MORE fun for us! Thank you for being a sponsor...totally love Newton with his coffee!